Ringwood Manor’s carriage barn has a history as unique as the Manor itself. After Peter Cooper and Abram S. Hewitt purchased the Ringwood property in 1854, Mrs. Hewitt set about transforming the property into a Gilded Age summer estate. Many of the existing buildings on the property were adaptively reused by Mrs. Hewitt as she transformed them into something useful for her family. Prior to the mid-19th century Hewitt occupation of the site, a crushing mill was located at the far western end of the present carriage barn. But the carriage barn as it stands today mimics the development of Ringwood Manor itself. While exact renovation dates are unknown, it stands to reason that it followed closely with the expansion of the Manor itself, c. 1860, 1875, and 1900. 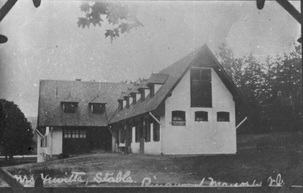 The carriage barn in late 19th century society was an indicator of wealth to those visiting the property. It was extremely costly to purchase multiple carriages, the horses and related equipment for riding, hire the staff need to maintain it, and constructing a building to hold it all. The original entrance to the Ringwood Manor estate was from a roadway nearest the eastern end of the carriage barn, meaning that visitors to the estate first passed the expansive and impressive structure before they even caught a glimpse of Ringwood Manor. 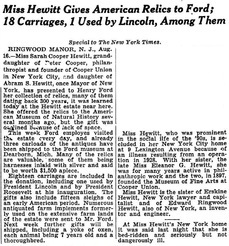 Miss Sarah Cooper Hewitt is likely the member of the family that had the most involvement with the development of the carriage barn. “Miss Sally” was a noted equestrian, adept at riding both English side-saddle and western. 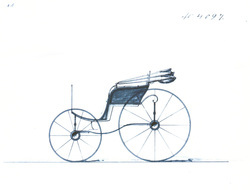 Sally Hewitt owned more than 40 horse-drawn vehicles, many of which were custom-ordered by her from the Brewster Carriage company. She also owned hundreds of additional reins, bridles, blankets, saddles, whips, and associated tack used for riding purposes. Before her death, Sally donated all of these items to the Henry Ford Museum in Dearborn, Michigan. Miss Sally was devoted to her riding horses and her horse-drawn vehicles, both at Ringwood and her New York City residence. She put a great deal of care into the creation of the carriage barn at Ringwood Manor. This is evident from features that were added to the interior of the barn. For example, the wood paneling seen on all the walls and ceilings of the barn is imported heart-of-cypress. The interior rooms are arranged so that carriages driving into and out of the barn never interfere with one another. The first room of the barn is the former carriage room. Two large double doors open into the space, which is where the carriages would have been driven through to come into the barn. This space is comparable to modern day garages, and would have held all of the horse-drawn carriages along with wagons and carts. A vehicle would have been wheeled into the washroom, located in the middle of the building. The space has inlaid brick flooring, sloping gently on either side to two huge drains placed in the floor. Around the room, former rods, hooks, and hangers can be seen. Large amounts of horse tack would have been placed on these items in order to keep them orderly. The horse stalls create a very long room at the far end of the barn that is divided into two sections. The first section consists of twelve regular-sized horse stalls on the left side upon entering this space. Each of these twelve stalls shares a semi-circular, gravity-fed hay feeder. Hay was forced down the chutes from the loft above to provide the horses with fresh hay. Windows are placed above each horse stall, but are all frosted glass. There are also large heat grates in this space, allowing the horses comfort even in colder weather. 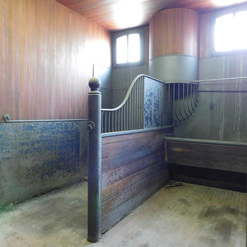 The furthest space in this area is comprised of three double-sized rooms which were used by thoroughbreds of the family and were additionally used for breeding purposes. The “putting-to” room mentioned earlier is neatly situated between the washroom and the horse stalls. When the carriage was rolled into this space from the washroom, the horse(s) that were to be used with the vehicle would be led into the space from the stalls beside it. Here, the horses were “put-to” the carriage (hence the name of the room). When complete, the entire outfit was driven out another large sliding door leading to the roadway towards the Manor house. There is a second floor to the carriage barn where there are three more rooms that held additional tack such as saddles, harnesses, and carriage shafts on the second floor. Additional closets for wagon poles and medicines for the horses are also in these spaces. A fourth room held the sleighs and their shafts for winter sports. The very large open space at the far eastern end of the second floor was a hay loft. Ringwood Manor was listed as a National Historic Landmark District in November of 1966, with the carriage barn as a contributing structure to the historic district. In 1999, the Ringwood Manor Association of the Arts, a 501(c)3 non-profit dedicated to the arts, moved their gallery into the carriage room. This space is used seasonally (April through October) by the organization for various art exhibits and displays. 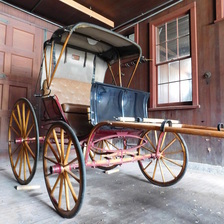 In June of 2012, the North Jersey Highlands Historical Society, a 501(c)3 non-profit created to support preservation efforts at Ringwood Manor, purchased one of Sally’s original Brewster gig carriages from a private owner. A second was purchased by Ringwood State Park in May of 2016, and a third in March of 2017. Ringwood State Park Staff and the North Jersey Highlands Historical Society have restored a portion of the interior of the carriage barn for interpretive purposes for the visiting public. Please see the Carriage Barn Exhibit page for details on when the building is open.